Do Orcas Go Crazy Because Of Petting Pools And False Hopes? Orcas who lived in petting pools show higher levels of aggression than others. The violent death of SeaWorld trainer Dawn Brancheau in the jaws of an orca named Tilikum in early 2010 triggered a series of journalistic articles and books (see also) on the history and conditions of orca captivity resulting in severe injuries and deaths to both orcas and trainers. This culminated in the documentary "Blackfish" that has strongly impacted the public and has led to an open debate on the ethical propriety of keeping such large, intelligent, and socially complex creatures in captivity. A significant part of the discussion has been the question of why certain orcas turned violent. Alongside the public discussion, the scientific community has been asking many of the same questions. One apparent reason for the aggression was the physically and psychologically abusive treatment that Tilikum suffered at SeaLand prior to arriving at SeaWorld. However, in the case of the aggressive SeaWorld orcas that never experienced SeaLand, the focus has been on such factors as the insufficient size of the pools, disruption of social structure, including premature separation of calves from their mothers, the constant pressure to perform, premature breeding of females, and a host of other possible reasons. There was, however, a bit of early common history in the background of several of SeaWorld's most aggressive orcas and their elevated aggression continues in a number of their descendants. These orcas and descendants account for a majority of the documented, published aggressive encounters at SeaWorld. They constitute a majority of the aggressions shown in "Blackfish" other than those directly related to Tilikum. The orca profiles that SeaWorld released make no mention of this early history yet this history has been hidden in plain sight on the Internet for many years in old photo sets and discussions if one simply knew the correct search terms. However, after the public airing of "Blackfish," some of the human participants in this history created a website called "Exploring the Cetacean-Human Relationship" documenting these early events and have sought to raise public awareness. SeaWorld's Icelandic captives from 1977 (Kandu 5, Canuck 2) and 1978 (Katina, Kasatka, Kotar, Shawn) were sent to the San Diego facility for performer training. 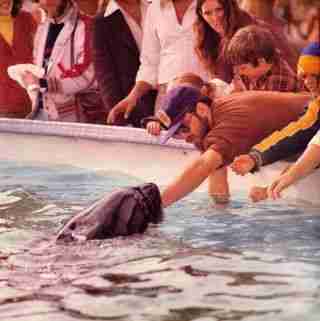 While in training, they were rotated through the dolphin petting pool. Pool monitoring seemed to be an incidental function of people with other main jobs, so it was sparse to non-existent. The orcas were in their first and second years of captivity and ranged in ages from about two to five years. The orcas were very outgoing, friendly, and gentle. The only impediment to interaction with visitors was the barrier of the pool wall. Over the years, many thousands of visitors had the opportunity to interact with these orcas. To the best of my and others' knowledge, no visitor was ever harmed. These orcas also established friendships with some repeat visitors. They recognized their friends from among the crowd and would approach them. The orcas presented themselves for belly rubs (please see accompanying image of Kotar having his belly rubbed) or beached themselves in a shallow area for full rubdowns. They invented games to play with human friends. I'm told they had a significant sense of humor. The orcas seemed to greatly value trust. If a human friend allowed an orca to mouth a hand or arm, the orca would gently pull his friend toward the water.They always let go, sometimes at the very last instant before their friend fell in. When the orcas mouthed a friend, they closed their mouth slowly, allowing the friend to decide whether or not to participate (please see accompanying image of Kasatka mouthing a human man). This seemed to be something the orcas did periodically both to test their friend's trust and as a friendly offer to join them in their world. Eventually, these petting pool orcas completed their training and began a life of constant performing. They could no longer interact with non-staff and lost contact with their human friends. Within a few years, they began to exhibit dangerous behaviors, resulting in many of the documented, published aggressive encounters. There seemed to be a loss of trust and the development of false hopes. You can also read more about this relationship in "Blackfish Revisited." Shawn died in her first year of captivity. Little has been published about (for example, whether she was ever healthy enough to enter performer training or be in the petting pool). Canuck 2 wasn't a good performer and spent much time in the petting pool. He died before completing training. Kandu 5 is shown in "Blackfish" bleeding to death after a fight. There is good circumstantial evidence that Kandu 5 was in the petting pool, but she had already moved on to full-time performing before the co-authors were on the scene. Cetacean Cousins' bio on Kandu 5 states, "Kandu probably spent some time at the 'Petting Pool' along with other young orcas shortly after her transfer." Kandu 5 was in any event a tank mate during the petting pool years. Kotar died at age 17 when a gate between pools crushed his skull. There aren't many published incidents logged about him, but various interviews with staff refer to him lunging aggressively at them and leaving bite marks. Katina and Kasatka are the two mothers in "Blackfish" who cry when their babies are taken away. Kasatka is also shown pulling her trainer repeatedly under water. Kandu's daughter, Orkid, is shown pulling a trainer into the water and breaking her arm. 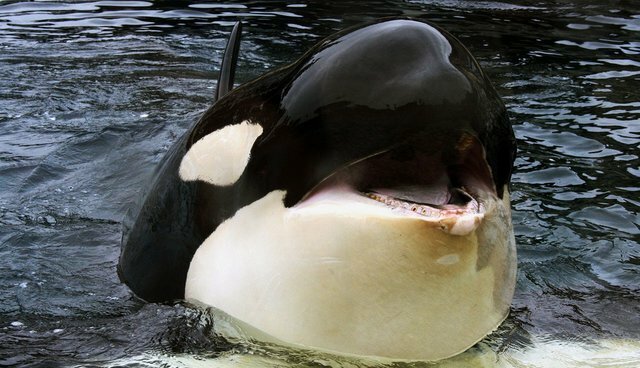 Kotar's son, Keto, killed the Spanish trainer at Loro Parque. 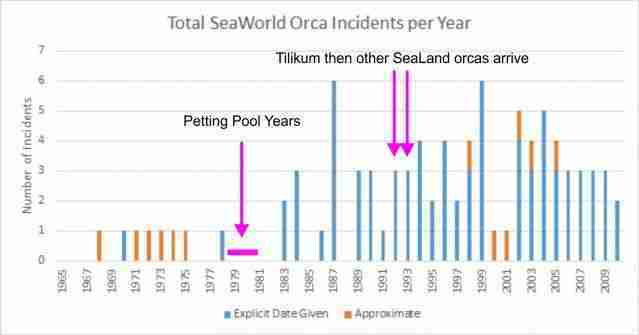 One can clearly observe the effects of this history by analyzing the published data on orca-human aggression at SeaWorld. The simplest look at this data sums aggressive encounters by year (please see above graph). There is a very clear increase in aggressive encounters following the cessation of the petting pool era. The arrival of Tilikum and then the other SeaLand orcas result in little discernible change in annual aggressive interactions. 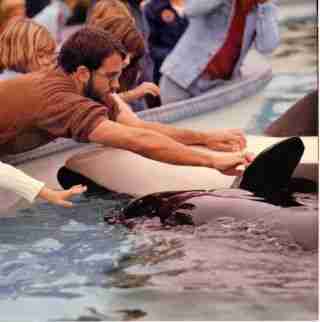 4.000: Orcas who were tank mates of the petting pool orcas during the petting pool years and their descendants. The issue of tank mates has considerations still being dealt with. 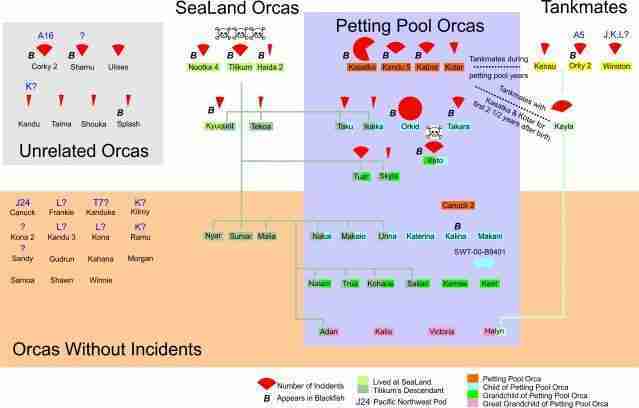 It should be noted that there is some overlap in the petting pool descendants, Tilikum's descendants, and the tank mates' descendants. It is objectively clear that there is a correlation between "petting pool" history and significant, later orca aggression. An entirely new scientific investigation into the why can now begin. As more of those early human-orca friends come forward and tell their stories, a more complete picture of orca mentality can be assembled from what was a onetime, freeform experiment in human-orca interaction, one that would be impossible to repeat today. This essay was written with the help of Robert Anderson, Howard Garrett, Russell Hockins (please also see "Unlimited Trust)", Robyn Waayers, and Lisa Larrabee whose poem "The Orca Among Us" can be seen here. You can read Russell Hockins' comment on an earlier essay I wrote here.